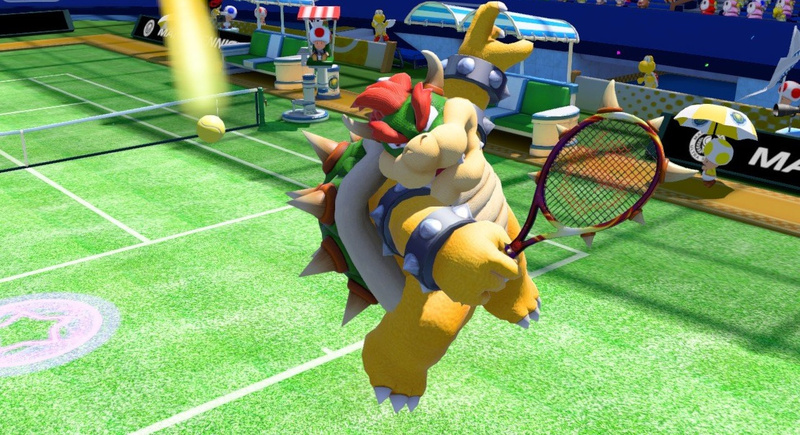 A surprise service sent over the net in Nintendo's Digital Event at this year's E3, Mario Tennis: Ultra Smash for Wii U marks the first home console appearance of this particular Mario Sport in over 10 years. If early impressions are anything to go by, it's one to watch for - the demo we played on the show floor was very simple, consisting only of Mario and Bowser battling it out on a single court, but it already felt extremely polished, and we had a blast playing several matches against a talented Nintendo rep.
Like its predecessors, Ultra Smash is a fast-paced, arcade-style tennis game that puts its Mushroom Kingdom court location to good use. The matches we played, for example, were part of the Mega Battle mode, in which enormous mushrooms wander onto the field from time to time. Picking up one of these iconic fungi makes your character grow to several times their size, which, as it turns out, is a double edged sword in terms of tennis - the increased reach and wingspan makes it easier to return wide shots, but we also lost a few volleys thanks to Mario's newly oversized noggin acting as an excellent target. No matter your size, you'll always have access to the same repertoire of racquet techniques, and along with basic Topspin and Slice shots - assigned to the 'A' and 'B' buttons, respectively - Ultra Smash keeps the multi-button shot combos from Mario Tennis Open: 'A' followed by 'B' sets up a Lob, for instance, and 'B' followed by 'A' a Drop Shot. One new addition for Ultra Smash is the Jumpshot; by pressing 'A' or 'B' twice in a row you can return the ball from mid-air, which is as satisfying as it sounds. All these different shot types play into Chance Shots, which sometimes see differently coloured spotlights appear where the ball is about to land. If you make it to the ball in time and pull off the particular shot indicated by the colour in the circle (red for Topspins, white for Drop Shots, etc. ), you'll send back your return with a massive boost. Our demo sets saw quite a few volleys where Chance Shots made the crucial difference, and they were thrilling to play for, adding a rapid-fire 'Simon Says' element to the already engaging arcade tennis action. We played on a Pro Controller, which felt great - controls were snappy and responsive, with intuitive button mappings and a fun new dive button assigned to 'R'. For players who haven't yet memorized the different Chance Shot combinations' colour coding - a task made more difficult without a bottom-screen cheat sheet as in Open - the 'X' button also acts as an easy way out. Tapping 'X' for your shots will activate the best shot for the situation every time, including during Chance Shot opportunities. While we're sure there will be an option to disable this in the full game (if only for multiplayer parity), it's a very welcome addition, and should help let everyone take a swing at the action. With Mega Mushrooms and the Mario cast, Ultra Smash's appeal is immediate, and it should be much easier to share the fun with an (optionally) reduced learning curve. We didn't see very much of Ultra Smash in the demo, but what we did see looked fantastic. Mario and Bowser are beautifully detailed - especially in their enormous forms - the lighting on the superpowered shots is gorgeous, and the little touches that Nintendo is known for are already shining through; we especially loved watching Mario's shoes rip up dirt trails in the grass when he was blown back by a particularly powerful shot. 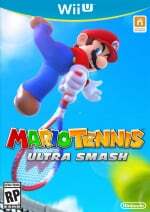 Like all Mario Tennis games, Ultra Smash is a Camelot creation, though since it's early on in development there's no word on what the single player content might look like, or if any of the RPG elements from the studio's earlier Mario Sports titles might make it into this Wii U release. Whatever form the final game takes, however, it has a seriously solid foundation; even in these early days, we had a great time with Ultra Smash, and can't wait to hit the courts again, Mega Mushrooms and all. Nice graphics, I'll probably get it, but it's not a blockbuster. I wonder if there will be motion controls? Hoping for motion controls but excited either way. Hey what do you know, another Mario game. Blockbuster or not, I've wanted this for a while and honestly didn't think we'd get a Mario sports game on a console ever again. I'm very glad I was wrong! I'm so freaking sold on this game now. Thank goodness the mega mushroom mode isn't a forced mode... Yes! I think I have to get back to my 3DS version and start practicing! As somebody who has been requesting a Mario Sports game for about the past 2 years I'm glad to see them finally make one, but since we already have tennis in Wii Sports Club I really would have preferred baseball or soccer. I know Sports Club has baseball as well, but it's so bad as to not even count as a baseball game, it's more like baseball practice in search of a game - can't play 9 innings, can't pick your teams, can't assign players to positions. Will probably skip this and buy the Olympics game instead. They should have showed the Olympic game yesterday. The Olympics is next summer and they didn't even put it on the infographic, and I bet it's out before Zelda U. It's like they don't even want people to know Wii U is getting games. Fatal Frame and Devils Third aren't on it either. Nintendo is purposefully sabotaging the Wii U.
I am actually looking forward to this. I thought the 3DS version was underated. Day one purchase here. Well, glad to know this game's solid. It's not what I wanted to see in the Event yesterday, but I hope folks will have a good time with it. I love to play actual tennis but after this E3 I'm going to be hanging up my racquet for good. You ruined it, thanks Nintendo. I couldn't like the 3DS version, but this one looks nice! When it comes out, maybe I'll trade it in for this one! I'm kinda excited for this. I didn't realize it had been that long since the last Mario Sports console title. I'm assuming amiibos will play a part. Perhaps in doubles? The 3DS game didn't impress me at all, so I'm hoping this one will make up for it. @Peter_Lemonjello Is there a #thanksNintendo on Twitter yet? I've heard that phrase so much the past few days. I hope its better than mario tennis open, and that this has tons of characters. thanks for what? sorry but nintendo dropped the ball. at e3 they showcased the B team. @rjejr I believe Nintendo was being Nintendo and wanted to keep the digital direct as pg as they could because we all know kids were watching. My kids were and personally am glad Devil's Third and Fatal Frame were absent from it. As for this game, I never cared for the Tennis version of this. I much rather have a console golf game as opposed to the 3ds game. Funny how Nintendo went to all the trouble of showing us a very intreging tech demo of a golf simulator back when they showcased the Wii U and no one has even given a thought to try it. It looked very promising as well. 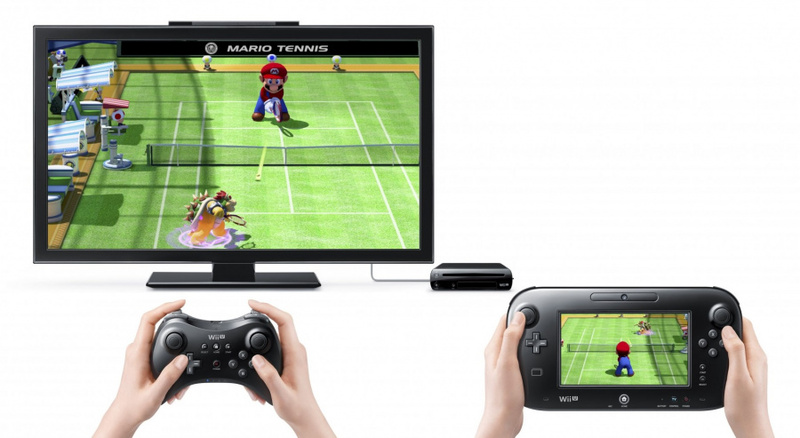 Mario Tennis Open was so awful. Mario Tennis 64 was my fav and since I'm not flatting any more I need some online multiplayer. Is that too much to ask for from Nintendo? Well that's my deal breaker anyway. Even more e3 news from Nintendo! Luigi's Mansion Crossword Puzzle and Metroid Hidden Object Party are on the way. Thanks Nintendo. Couldn't care less myself, but hopefully it'll be good for the fans of the genre. @Spoony_Tech - Summer Olympics isn't PG? They showed Skylanders. And they could be showing the other 2 more the past few days, I know why they weren't in the NDE. But what about that infographic? They can't have M rated games on the inforgraphic? And isn't that gold thing in Sports Club? That's all I recall seeing of golf is what's in Sports Club. sorry i f that all is coming across as antagonistic spoony my 10 year old is kicking me off the PC, he's very impatient rush rush. Great addition to the Wii U's catalog as far as I'm concerned. If it's better than Mario Tennis Open then i'm in. To the author of this article from a long time tennis player: The word "rally" should be used where you wrote "volley". "Volley" in tennis is simply defined as hitting the ball before it hits the ground. A "Rally" on the other hand is defined as two players hitting the ball back and forth...what happens during a single "point". People that don't play tennis use the words volley and rally interchangeably but they are NOT the same thing. Google the word volley if you don't believe me. Should I rent or buy that one? It took me forever to even know of Mario Tennis Open's existence. This was a pleasant surprise from Nintendo at E3 this year. I loved the Game Cube game in the series and look forward to picking this up day one. I'm sure this game is fine, but I'm super sour that this was half of the new Wii U lineup - the better half, even. Either way, not for me, especially since I'll likely be getting the Mario & Sonic at the Olympics game. @luke17 Ha, thanks! I actually think someone pointed that out the last time I wrote an article about a tennis game - one of these days I'll learn! I'll bite I really liked the 3DS MT . I could go outside in my backyard and play tennis. @RegalSin But could you play against a fire-breathing turtle? @rjejr "Purposely sabotaging the Wii U". What is the biggest slap to the face, isn't to us the fans but to the developers that worked long and hard on Devils Third and Nintendo won't even a knowledge them! Finally some 3rd party support and they basically flip them off. What is Nintendo's strategy? They are setting themselves up for absolute failure on all fronts. It makes me sooo sad as a long time and loyal fan. If you will excuse me I'm going to go play Metroid Prime Trilogy until the next "real Metroid" game sees the light of day. I was so excited for this game, but the fact that they demoed it WITHOUT motion controls worries me! Despite loving Camelot's tennis and golf games, I'll skip this if it does not have decent motion controls. The Holiday season wont have the absolute blockbuster it's had in the past with Super Mario 3D World and Super Smash Bros U, but it should actually have a lot of depth and quality to choose from. It's usually one must have title but customers will actually have a choice of solid games such as Xenoblade X, Star Fox and Mario Tennis to choose from. My guess is Fox is bumped up to Black Friday and gets a late November release day while X and Tennis are your actual Xmas release games. Either way, Fox and Tennis are day 1 buys for me. The Wii U may be dying soon but at least I'll have 15 excellent games to keep in my collection. In 15 years, the Wii U will be highly collectable and while the depth of games wont be there, the quality will be excellent and highly sought after. I loved Power Tennis on Gamecube, but the 3DS game was kinda rough. Not buying if chance shots can not be turned off. This for me without a doubt was the one real highlight of Nintendo's E3 showing simply because it was the only NEW! Wii U game announced that I was interested in, I just hope that it has online play which to me is a must for this type of game, and also I hope they don't go overboard with all those silly power shots and it plays a fairly realistic game of tennis. Also would love to see a Mario Golf game for the Wii U, not had a Mario Golf game on a main Nintendo console since Toadstool Tour on the Cube, so well overdue IMO. The 3ds version is superb! No thanks - not big enough improvement. Should have used those resources for something more interesting. @Hero-of-WiiU If you are going to get the WII U version I would say rent if not then buy. Can you just turn off the chance shots and play a game of Tennis? If not I'll stick to Virtua Tennis. Mario Tennis has always been a great game, especially on the N64, but from what I saw during the Treehouse session I wasn't impressed. The super mushroom thing just broke up the play with unnecessary cut-scenes and the animation looked so jerky, as if it was running at 15fps - to be fair that may have been the transmission but I had the setting up to 720HD. That's what I'm saying! Golf would have been my top choice. But, I guess I do have the amazing Mario Golf World Tour on 3DS and the Wii Sports Club Golf is absolutely brilliant (it could have been made it's own game, easily). @Captain_Gonru - "It's like a tech demo"
That's what I said. Ok, I called it "practice", you know what I meant. No tinfoil hats for me, I'm waiting for the mother planet to call me back home and I need to keep the radio waves open. Might get this one depending on Singleplayer content and online functionality. Does this game support motion plus? What's the point of a tennis game without it? It's the same reason I didn't bother with the 3DS version. @Captain_Gonru - "But if so, then I have to ask again, what's the point?" You know, I'm starting to get a bad feeling that this E3 isn't going as well as Nitneod may have liked. @Captain_Gonru - "but the common theme this E3 seems to be wrong choices"
No, the theme is "transformation". Transforming game franchises that you love into games that you loathe. Didn't you even watch the ND? @Captain_Gonru - Yeah, you're right individually the games aren't too bad, but as a collective E3 presentation, well loathe may be too strong but I don't think it was good. And I said this in another thread, but I think Nitnedo got our hopes up by telling us Zelda U would not be shown. At least I thought they must have something good to show if they weren't showing Zelda U. And Imay kid you abut ACaF but it doesn't seem like a lot of people are happy w/ that board game mechanic. Or Metroid Prime. It was too much change, and mostly for the worse it seems like. And really, somebody had to speak up and tell them those Starfox graphics aren't great. They just aren't. Maybe it will be a great game, but it was really the only game trying to carry a 50 minute broadcast, and it needed to look a whole lot better than that to do so. And maybe it was the first time showing it, but nobody could have been surprised by that announcement that a Starfox game was coming. It wasn't a "megaton". That seems to be the word of the day. Turkish Furniture is an gimmick along with Orientalism. Japonese style is an gimmick. Yo-Yo craze from the 1990's was an gimmick. They come and go. I will admit that is not an new idea and wish it was so but it is not. Like take Ghost Bowser in "Luigi Manson". So now Bowser is an evil spirit now, oh great lets give that to small children to play with. See, this is actually a very solid title and I like that Nintendo doesn't appear to be forcing too many stupid gimmicks into it; like pointless motion control. I probably didn't give this enough respect when it was shown during the Direct. It's nothing mind blowing but it doesn't need to be if it's just a very solid and actually good looking tennis game, with Mario characters. To be honest; that's kind of all I ever wanted from a Tennis game. I probably would have been happier to see it if it were in among a bunch of big AAA titles in the main franchises we really all wanted and kinda expected to see. Nice! I don't see how motion controls will work with all those button controls! I'm very surprised that anyone is excited for this.